I have a real love affair with Barcelona. Granted it is a tourist haven, not the most Spanish, nor the most Catalan, but I love it. There is a creative energy about the city that gets me going. 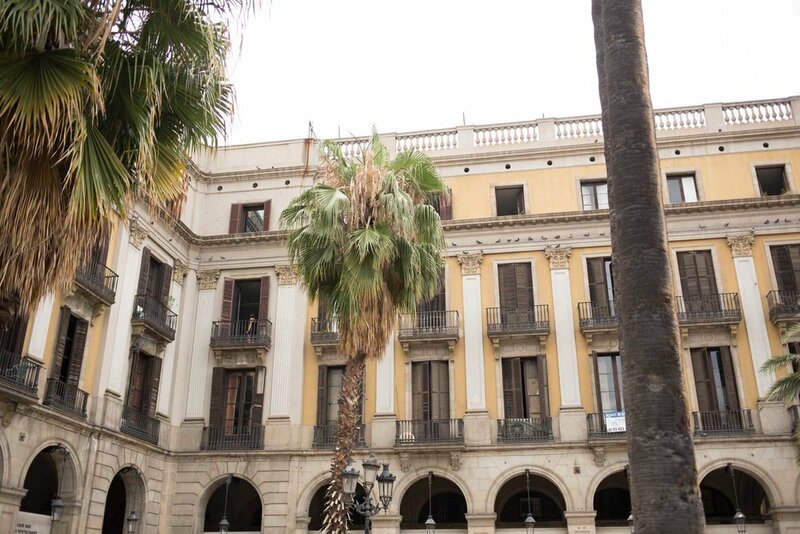 Plaça Reial is home to one of the most expensive hotels in the city and one of the city's most popular youth hostels. Throngs of tourist line the plaza cafes and restaurants. Hawkers fling annoying light up "helicopters" into the air and an odd mix of tourists mingles under the lights of the square. In itself the plaza is beautiful. Within the city Plaça Reial has to be the place that I hold with the most disdain, but also the place I somehow always return to. I have fond memories here. It was one of the first sites I visited in the city where friends of mine were staying at the famed Kabul Hostel in 2008. I brought in the 2009 new year here at midnight with a great group of people who I have mostly lost touch with, but crave a reunion with — if only we could go back to that night, just for a night! Later in 2009 I would wander through in early December just to ogle the tourists. I actually stayed at said Kabul Hostel in 2012 with a friend couple who were living in Madrid at the time. In 2014 I sat here with a dear friend having an amazing gin & tonic at Ocaña in the rain after a few civilized days of drinking around the Saint Joan festivities in June. And finally in 2016 I sat at the same restaurant while the wind swept violently through the square with my partner who was almost 7 months pregnant with my daughter at the time. I'm not sure when I will be back to this place, but watching the odd mix of hostel goers, street hawkers and the affluent diners mingle in the square is oddly comforting.